You’ve had a fascinating life Dorothy, could you please tell me about it from the start? I was born in Germany and my family was a very cultured Jewish family. In 1932 when I was 8, Nazis were beginning to show what they meant, and my father whose nationality was not German was able to move us to a state close to Lithuania, and my background is entirely complicated, even I have to try and remember! Later, when I was 14 my father was able to send me to boarding school in England because he did a lot of business with Manchester’s cotton trade. (Dorothy’s father had his own textile business) And for me it was an extraordinary change when I went there. I met the man who became my husband while I was at college. College of technology was part of Manchester University, which had a vocational course on photography. I was 16 and my past life had completely gone. During the day at 18, I had a job at a portrait studio. I remember I went to see if I could possibly join the women's army. They asked me what was I doing? And I said I'm a portrait photographer. He then said Oh; well it's an essential job to keep up the morale of the people, if you don’t want to join, carry on taking photographs. I’ve been in Hampstead now for 50 years, I was very happily married here, and both my daughters were born in Hampstead and went to school here. I‘ve lived in Paris, I’ve lived in New York, but this country is the very best of all, it's fantastic. So at 18 you were taking photos of loved ones and family members to send to people fighting the war to keep up morale? Absolutely! I was working in my studio from 16 to 19, and I used to try and find out who is the picture for? Was it for the family? Was it for a boyfriend, girlfriend, and so on? And at that time all we had, because film was very short, I had four shots only for each sitter, and having found out whether it was for a girlfriend or a boyfriend or a grandmother, I chose two with that in mind. The other two was me looking at the person, and I'm happy to say that they mainly chose the ones that I saw them as. Photography wasn’t the only work I did during the war. I also took evening classes for young photographers coming back from the army wanting to relearn, and I was also chosen by the MOI (Minister of Information), to join their group of lecturers/speakers. So portraiture was the beginning of my professional life, and I must admit, in the studio everything is under your control. But in 1945, Louis the man who befriended me was a scientist, who was studying for his PhD. And as I was brought up in a family that believes in education, I said I would only get married IF he continued studying. And he said all right, and let's find a place where you can have your own studio. Neither of us had any money, so we borrowed £300 from a friend’s family, and we started a small studio in 1946, in Market Street, Manchester. And I must say it was very successful. In 1947, because I had been working hard in the studio and doing well, somebody approached me and said they were very interested in my opinion of something in Switzerland (a studio), would I go? I went, and Louis came with me. We arrived in Paris, on the way through to Switzerland, and my first picture ever taken in available light was in Paris. And it was from here that photographing in available light fascinated me and challenged me. My fascination really, was to capture what the world was like. And I've always said I wanted to keep what would disappear. Because in my lifetime, I have seen all the things that have meant something to me disappear. Is that a mindset you had throughout your photography career? Yes. I think it was to compensate what I had lost to a great extent, and also because there are so many ugly things and cruel things. And I’ve done the very opposite. I always felt that one needs things that are beautiful and gentle. In my portraiture too, I avoided hurting people’s feelings. My husband and I knew quite a lot of important people, and I’ve never been interested in photographing people who are being photographed regularly. So for me, it was the ordinary men and women that interest me. And it’s been a lifetime. 75 years of photography, which is a lot! Was capturing candid shots of people on the streets fulfilling the creative passion you had been missing from your studio work? Oh absolutely, it was very different, and very good, and very demanding too. People have asked me do you always carry your camera? I would say I’d go mad if I did! Because when I carry my camera I’m much more intense! And I only take my camera when I’m out to photograph. And when I did that book ‘Sixties London’ I would decide in the morning if the light was right, not necessarily as you know ‘sunshine’, and I would decide where to go. Go to Whitechapel, go to the City, and so on. I was also lucky because Louis became Director of Vyella, and I was able to photograph what I wanted. Which was very important, and it has certainly been very exciting. Do you feel the beauty of shooting street photography is not having any control over what’s happening, or knowing what moment you’re going to capture that day? Yes, but you know it’s also what you’re interested in. And then you concentrate on that. If you take two people who are very different as Martin Parr, and I. (Dorothy sold Martin Parr’s very first picture through The Photographers Gallery.) He’s done brilliantly. But it’s the very opposite of what I’m looking for, which is good. I look for something that has inspired me, and if people who look at the result like it, wonderful. But I don’t take photographs for other people or for publications. Although of course it was very wonderful to be able to do Sixties London. And Norman Hall said to me “You can’t.” [It’s too diverse] If he said that in the 60’s, imagine what he would say about London now…the world! As we are talking about London Dorothy asks me. I don’t know whether you know, but Timeout London chose one of my pictures as one of the best pictures of London made. They made me choose ten of my pictures and they chose one, which was the most successful. She then searches for the image in her ‘Sixties London’ book. It was this one. There’s something quite tragic about this face. She’s quite beautiful, she has beautiful hands, and she was selling the doll, and there’s something about her. It’s tragic but beautiful. Do you know quite often, as I look at my photographs I will get back to the moment I took them. It’s quite abnormal. Not only do you see the beauty in everything. I also love how well you use humour in your work. Thank you, the Jewish Museum in London said (Dorothy’s ‘Sixties London’ is exhibited here until August 29th 2016) they watch people looking at them and they always smile. Without humour life would be terrible. 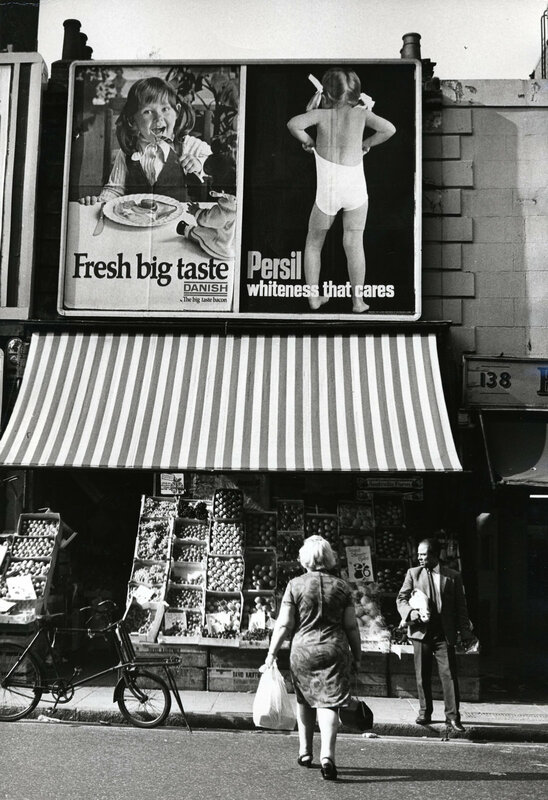 Dorothy also played a huge part in the 1971 founding of The Photographers Gallery London, where she was also its Associate Director for fifteen years. A gallery of photography in London was an idea born from one of the organisers (Sue Davies) of a two-part exhibition at the Institute of Contemporary Arts in 1969 that included work from Dorothy, Tony Ray-Jones, Enzo Ragazzini, and Don McCullin. Before then photography was not widely accepted at all, whereas now it’s incredible. Well everybody with a mobile phone is able to take photos these days. Yes, but maybe they also know it’s not so easy to take a GOOD picture! You know what upsets me? Monica is an Artistorian, and she writes about exhibitions, which I sometimes attend with her (Most recently to Auerbach at Tate Britain) and nobody looks at the pictures, they just take their mobiles out and look at the art through their screens…it’s strange. I want photography to be enjoyed; I think that’s quite important. Incidentally, I haven’t gone digital, because at this stage of my life there’s no point! And I absolutely loved the dark room work. A wonderful thing seeing your image appear. Although I never wore gloves, so I ruined my hands with the chemicals. Who or what encouraged you to pursue your photography style? When we lived in Paris, I was introduced to a very good young artist called Avigdor Arikha, who took me to places in Paris that tourists wouldn’t go. He was a completely crazy guy, but brilliant. If I think back, from the very beginning my pictures were liked by artists; which was an encouragement. It was very important to have that encouragement, as I didn’t know many photographers. Which of course changed dramatically after the opening of the Photographers Gallery, where I got to know a lot of very very nice photographers. What I’ve done in someways, leaving behind something that was and changed. And that’s a kind of duty. If the war hadn’t happened and I had stayed in my place of birth, I would have studied medicine, that’s what I wanted. And I’m very happy I have one daughter who’s a medic and a granddaughter who’s a medic. But it wasn’t to be for me. I think it’s important one has something to give, and in photography, for me the fact that people are enjoying that little exhibition of mine is pleasing. You have captured wonderful moments of children through the years, how do you feel about the restrictions (even though they are self imposed rather than legal) placed on street photographers today trying to capture these sorts of moments? It’s a pity, and it’s very sad actually. I must say I was lucky. If a photographer particularly wants to photograph something, and the person is there, they could try to make contact with the person and assure them and say if they would like to have a picture, that sometimes helps. But quite often in my photography I worked very quickly, and it was usually done before they even noticed anything. But then I knew I wasn’t taking a picture that could be hurtful, that’s important. And to take some pictures where everybody looks ugly and unhappy and so on, I can’t blame them that they don’t want to be taken. It’s such an individual approach. If anyone noticed I would explain why I was doing it, and if they’d like a picture, most of the time they were quite flattered. But I was taking them because they were interesting moments. You can’t make rules. If somebody like me has to take a photograph because they want to, they would do anything to get it. It’s a little more complicated now, that I do realise. And from capturing the feelings of human moments you started shooting abstract street shots with torn posters, which were published in your book ‘Breaks in Communication’. What fuelled this change? The fact is, if you are somebody like me, seeing is what matters; and I got very interested in torn posters, and I am interested in anything that I see. If you choose photography, you choose it because it’s interesting to you. You said earlier, photography wasn’t widespread when you started, even less so, female photographers. Do you feel being female was advantageous shooting street photography? That’s right, very few women. I got an invitation to a breakfast for the Honorary Fellows of the Royal Photographic Society, and there was a huge list of photographers, but only four women. Women can be very fine photographers, of course you have Julia Margaret Cameron, she was a wonderful photographer. Lastly, if you were giving a young Dorothy Bohm advice going into photography what would you tell her? Be alive and cherish the life you have, and try at the end of each day to say that I have done nothing that I am ashamed of. I think it’s very very important that one should lead the sort of life that they can be proud of, nothing to do with money.